Fittingly born December 6, 1866 in Kingston, Ontario, George Alfred Meagher was the youngest of fifteen (yes, fifteen!) siblings. His father John was a second generation Irish immigrant to Canada who worked as a wine merchant at Meagher's Brothers Distillery with two of his brothers. Growing up in a large family, it's no wonder that the Meagher siblings all spent a lot of time together... and it was on the ice that much of that time was spent. Several of the Meagher boys developed interests in both figure skating and hockey and took to Lake Ontario and other rinks in the Kingston area to practice their new hobbies. Although George's older brother Daniel played in the first hockey game ever held in Montreal on March 3, 1875, it would be George's contributions to both figure skating and hockey that would be more widely remembered by historians. In 1891, George won an international open competition held at Dey's Rink in Ottawa that was billed as a World Championship but not recognized officially as the ISU had of course not yet been formed. Several of these 'World Championship' type events were held sporadically in different parts of the world and would today probably be more akin to some of the 'senior B' type international events that pop up all over the world every autumn. George's chief rival was his fellow countryman Louis Rubenstein, who refused to compete against him at this event "for personal reasons". 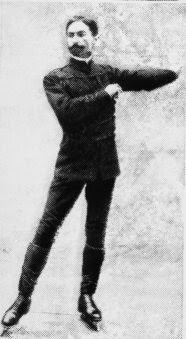 In the preface to George's 1900 book, Lord Minto recounted his acquaintance with Meagher: "He was... well known as a good and graceful skater, and held that rank at Montreal by those who were certainly qualified to be critics. He was, if I recollect rightly, at that time skating on the public rinks and afterwards at Governnment House, Ottawa, and was always most kind, not only in giving a display of his own powers, but also in instructing those who were novices in the art of which he is a master." It was Lord Minto himself who presented George with his 1891 medal and who noted of "since the year 1891, Mr. Meagher has received many trophies from various skating clubs in America, and also, I believe, from similar clubs in Europe." 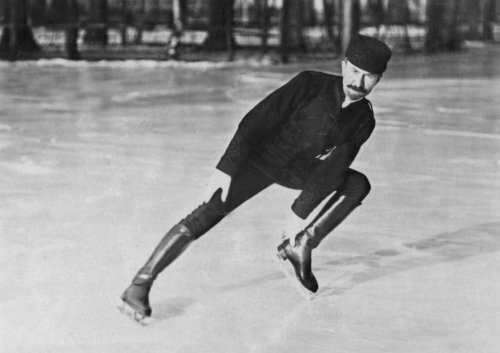 After his title win in 1891, George decided (much like Jackson Haines) to make the trek to Europe to give exhibitions of his 'fancy figure skating'. When he arrived in Paris, France in 1894 to give figure skating exhibitions he learned that the people of France had no sweet clue what hockey was. George joined Club de Cercle de Patineurs de Paris and stayed in Paris for seven months, during which time he taught the Frenchmen hockey and put together a hockey league that played four times a week. He did all of this with only a handful of hockey sticks he'd brought with him from Canada... which almost reminds me of that Canadian Heritage Moment commercial about basketball where Miss Thing's like "but we need these baskets back!" I digress. From France, George traveled to London. He skated for the Duke and Duchess of Teck, Duke and Duchess of Saxe-Coburg and Gotha, The Princess Louise presented George with a medal at this special party. Again pairing his love of skating with his pioneering efforts in bringing hockey to Europe, he made a hop, skip and a jump to Scotland where he taught the good folks of Glasgow how to play hockey as well. Like The Littlest Hobo, he didn't settle down in Great Britain either. Having now seen London and France, one might suspect the next thing he'd see were someone's underpants. We don't if he did or didn't, but any rate the next place George went was Germany, and I'm sure they had plenty of beer there so you really can't complain, right? He made stops in Nuremburg and Bavaria then carried on to St. Petersburg, Russia. On each stop he continued to almost act like a missionary of hockey but also made quite an expression with his skating as well. His tour of Europe ended in 1896 and he returned to North America on the ship 'Aurenia' in the autumn of that year. The Aurenia landed in New York so... you guessed it, George decided to get out on the ice there too! A December 13, 1896 article in the "Brooklyn Eagle" reported, "He learned to skate when a child. As he became more expert he added more tricks and originated others until he gained the undisputed title of champion of the world in his profession. His repertoire of steps, tricks and figures is now a long one. Among other things he can do twenty-three different grapevines, fourteen spins and seventy-four figure eights, and over one hundred anvils on foot without stopping. Stars, flowers, letters, birds, etc., without number and tricks at jumping, fill out his programme. He does all these things with a grace and suppleness which leave the novice little idea of the real intricacy and difficulty of the figures and the risks he takes in his jumps. The latter require great strength of the legs and ankles and if he did not land squarely on the edge of the runner and stay there after a jump, broken bones would probably follow. Meagher is proficient in the different styles which mark the nationalities of the European skaters. He is the author of 'Figure and Fancy Skating' which was published in London and for which the Earl of Derby, now the mayor of Liverpool, wrote the introduction. The book is illustrated with sketches by Lord Archibald Campbell, brother of the Marquis of Lorne, and has a chapter by Dr. Montague Williams, the author of the English book on skating. Algernon Grosvenor, president of the London Skating club, furnished 195 diagrams and the work is an authority of its kind. Meagher is also the inventor of a skating and athletic shoe." I'm sorry, I had to stop right there after reading that quote. Could there BE anymore parallel's to Jackson Haines' story? Seriously though! In fact, George didn't write just one book about ice skating but in fact penned three. In addition to his 1895 book "Fancy And Figure Skating" - the first book on figure skating by a Canadian author - he also penned the earlier mentioned "Lessons In Skating With Suggestions Respecting Hockey, Its Laws, Etc." 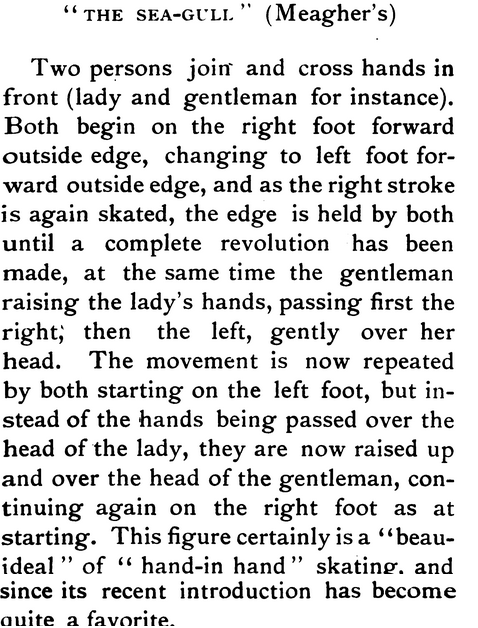 in 1900 and in 1919, "A Guide To Artistic Skating". He made frequent short trips overseas in the subsequent years, heading to Austria in 1898 and reportedly winning 'the World Professional Championship' in Vienna, in 1898. Sadly, much like the amateur 'World Championship' George won, that title wouldn't be historically always recognized. In the article "Professional Figure Skating Competitions: What You Didn't Know", we learned that the first accepted date for a World Professional Competition was in 1931 in Great Britain. George also played a role in the formation of the Minto Skating Club and skated with Lady Minto, was one of the earliest references to the crossfoot spin I could find (1900) and invented many of his own special figures, among them The Rattlesnake, The Combined Locomotive, The Demon Eight and The Sea-Gull. His figures often represented a less rigid approach to the English Style of figures skated by more than one person. Having introduced hockey to much of Europe and having quite the successful figure skating career, George got involved in the organization of hockey tournaments, even traveling to Belgium in 1906 to run a hockey tournament there. He also skated professionally in shows, learned barrel jumping and even performed before Queen Victoria. Much like many artistic people, George didn't stop there and was ready to perfect yet another artistic outlet. He took up watercolor painting and became quite the successful art dealer. He married Irene Erly and together they had six children, five of them girls. The family settled in Toronto and then Montreal. In 1930, George suffered a fatal bout of pneumonia and passed away. His burial certificate described him as an 'artist', but didn't specify he was a skater. He was posthumously inducted into Skate Canada's Hall Of Fame in 2010. Whether you're a hockey fan or a figure skating fan or both, one thing's for certain... both sports owe this man a great debt for the time and effort he took to get out there and share his passion.